Yesterday Jeremy and I were wondering why clocks go around twice per day. What’s wrong with once per day? It turns out a partial answer is as easy as checking Wikipedia’s 12-hour clock article. Splitting the day into two periods is actually very natural, day and night. This dates back to ancient Egypt as does the division into twelve units. The major problem, though, is that the hours have to be of variable length. The Romans would have none of that and things got a little more regular from then on. Interestingly, “the first mechanical clocks in the 14th century, if they had dials at all, showed all 24 hours.” But, “during the 15th and 16th centuries, the 12 hour analog dial and time system, with its simpler and more economical construction, gradually became established as standard throughout Northern Europe for general public use.” This might be getting to the heart of our question, but I’m still confused, why does a 12-hour dial have “simpler and more economical construction?” Gearing down by a factor of two can’t be very hard, so I’m left unsatisfied. One advantage of the 12-hour clock is an increase in precision if you only have an hour hand. It is not unreasonable since, as many sources such as this state, the minute hand wasn’t invented until 1577 by Jost Burgi. 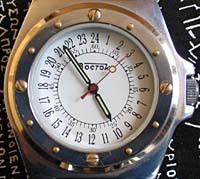 Thus the transition to 12-hour dials happened before the minute hand.